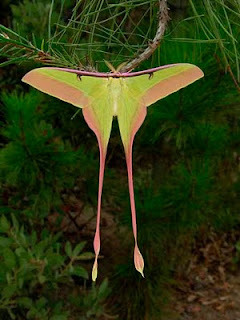 The Chinese Moon Moth or Chinese Luna Moth ( Actias dubernardi ) is another example of why I love this genius ( and Moon Moths in general ). They're absolutely gorgeous. Now before you go and say "Why are they're 2 different moths in this post?" I'll get to that. Apparently lots of Actias sp. are sexually dimorphic. I never knew that. I thought that they were all similar in appearance. But once again I feel the need to stress my little "motto" when it comes to these things. "Never assume anything about the insect & spider world you just might be proven wrong "
It's true though. And most of the times you WILL be wrong. It takes 70-85 days from an egg to the adult, depending on the temperature and humidity conditions. Female lays up to 120 eggs, she doesn't care about the place of ovaposit. The egg is oval-shaped, 1,5mm x 1mm; whitegrey colour, firmly stuck to branches or sides of the cage that the female had been kept in. 4-5mm long caterpillars hatch after 10-14 eggs, the warmer and the higher the humidity, the quicker it happens. Newly hatched larva is of black colour with hairs, it sheds its skin 4-5 times in its larval stage. Until the second instar it is orangebrown, after which it changes into beautiful green with silver spots. It is hairy in all its stages, and it feeds on pine tree. Fully-grown caterpillar is 60-75mm long. It spins its brownish cocoon on the soil, but more often among pine needles. They are easy to rear, so long as you can get them to eat in the 1st instar. The species comes from high mountaineous regions, so it is quite cold-hardy. It is best reared in-doors, sleeved on a small pine-tree. The chrystalis is about 35mm long,and the imago emerges from the cocoon after about 4 weeks, dependant on the temperature and humidity. 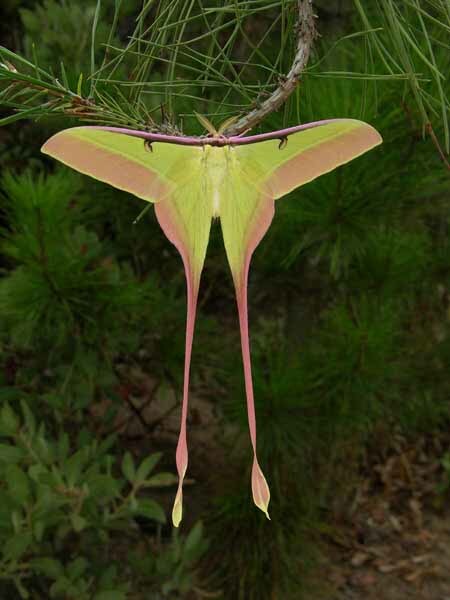 An adult moth's life is short, no longer than 10 - 12 days (females live longer due to their fat reserves). Pairing is easy, in medium-sized cage. There you go. 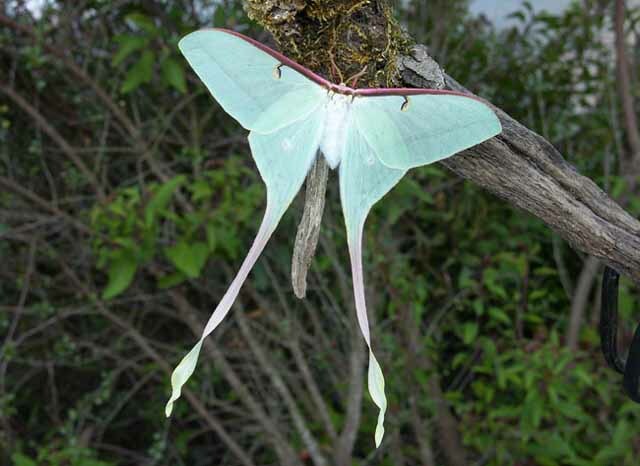 Another thing is that these moths don't live long. This holds true for all Moon moths ( and all other Saturniids if I'm not mistaken ) due to the fact that the adults lack mouth parts. How do they survive for even that long? Well they're living off the fat and energy stored up when they were caterpillars.